Manage all your reports on one page. Report name. Selected report name. Type. Type of the report. Export. Format of the report. Date range. Date range of the report. White label. Name of your brand. Mind: you can create several report templates for one project. 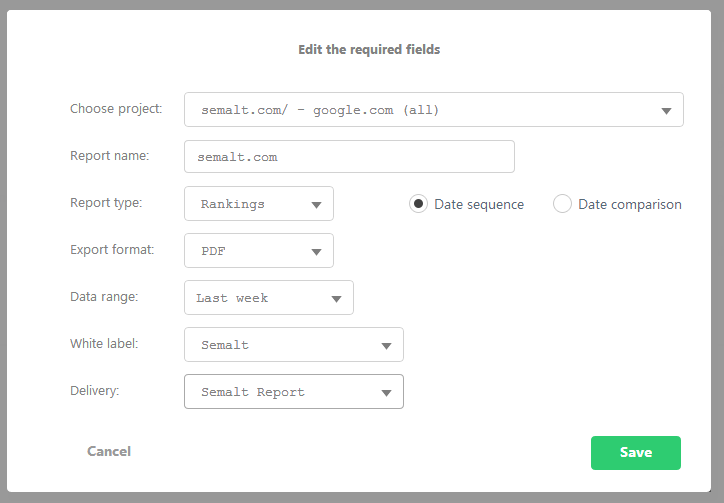 Actions: you can easily manage your templates using the Report list Schedule. You have selected the frequency of report delivery in the settings. But you can download the latest report right away. Click the button Download in the field ACTION and save the document on your hard drive. Make the necessary alterations and click Save to activate the changes. You can easily delete the report template. Click the button Delete report in the field ACTION and confirm this task by clicking Yes in a new dialog box. If you pressed this button by mistake, click NO to cancel this task. Status: enable/disable report email delivery with one click. You can temporary disable report delivery without removing the current template from the Reports List: use the On/Off checkbox in the field STATUS. Can I restore a template deleted from the Report List? Unfortunately, you can’t. Carefully read the system notifications before deleting the template. The template will be deleted only after your confirmation. I have disabled a report delivery template. How can I enable it? Place the switch in the field STATUS to the position ON. The delivery will be activated starting from the next date specified in the settings. The button Download the latest report won’t work. What is the reason? The possible reason is that the system didn’t have enough time to harvest data for the reports. Carefully check the date range and report delivery settings. Hover the cursor over the button Download the latest report to see the date of the next report that will be delivered to your email.